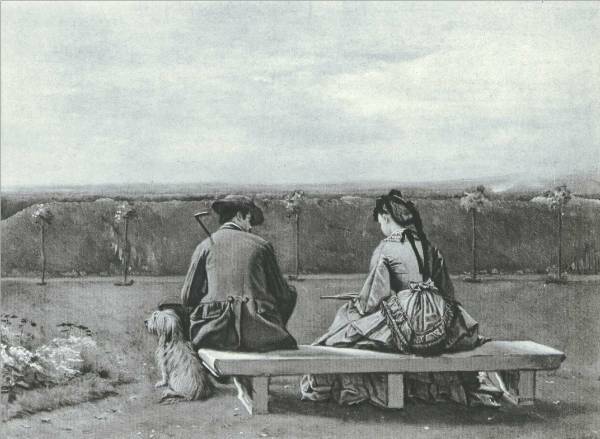 A black-and-white reproduction of a Crowe painting, entitled The Bench by the Sea, appears in Graham Reynolds’ Victorian Painting (1966), and was said at the time to be in the collection of Mrs Charlotte Frank. It shows the rear view of a couple sitting on a bench, with the man turned slightly towards the woman, with a rather concerned demeanour. The woman looks down at her lap. The clothes the people are wearing look like contemporary clothes of the late 1860s or early 1870s. It is hard to make out any seascape in the painting, although the monocolour of the reproduction makes it hard to discern details; however, on reading the contemporary description below of the painting exhibited as Tiff, a dull-looking hedge would fit what can be seen. It seems clear that the painting was misinterpreted over time, and re-named The Bench by the Sea by one of its owners. The mis-identification was repeated by Christopher Wood in his Dictionary of Victorian Painters (1978), who praised the painting as an example of a simple and successful genre work. According to the Bridgeman Art Library, the painting was latterly in the ownership of the Mallett Gallery (antiques and fine art dealers) of 141 New Bond Street, London. In February 2006, a small pencil sketch, size 2.5 x 4.5 inches, marked ‘Stone bench intended[?] in Picture The Tiff”, and signed and dated February 1872, was offered for auction on Ebay under the title ‘Stone Bench’. It shows a bench virtually identical to the one in the finished painting. It was offered on Ebay by Raye Dean Gilbert, Fine Art Dealers. It was offered again in June 2007 by a dealer from Houston, Texas. ‘Tiff’ (354) is a capital little picture of a young lady and a gentleman seated on a bench in a public garden, their backs being towards us, and yet almost as expressive of a ‘tiff’ as their faces could be. The painting is as firm and precise as in No. 214 [Bob-Cherry], and the colouring less chilly; the background is needlessly uninteresting, being nothing more than a green hedge. The humour of this picture is complete.